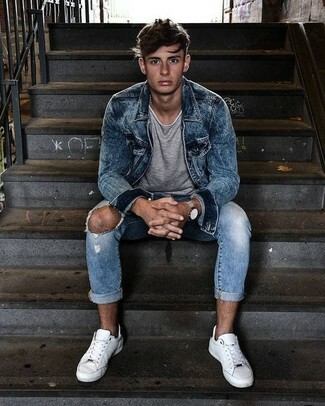 If you're scouting for a casual yet dapper getup, wear a Vivienne Westwood Anglomania classic denim jacket and grey skinny jeans. Both garments are totally comfortable and will look great paired together. Complete your getup with black and white low top sneakers. 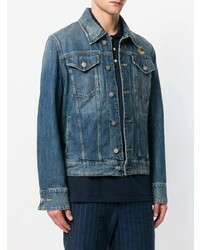 If you're hunting for a casual yet seriously stylish outfit, rock a Vivienne Westwood Anglomania classic denim jacket with dark brown corduroy jeans. Both items are totally comfortable and will look great paired together. 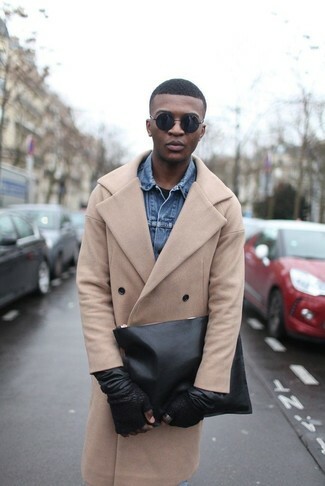 Grey low top sneakers complement this ensemble quite well. 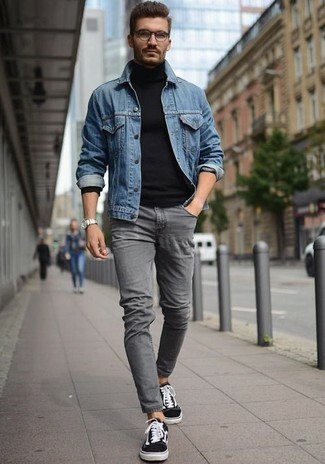 If you're on the lookout for a casual yet seriously stylish look, consider teaming a blue denim jacket with black skinny jeans. Both items are totally comfortable and will look great paired together. 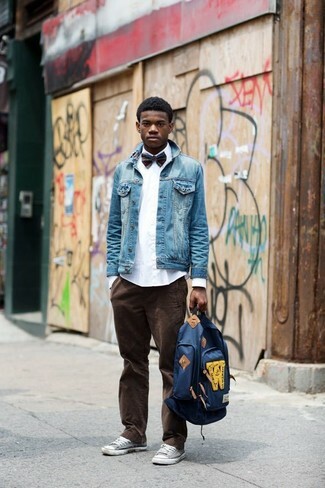 When it comes to footwear, this outfit pairs nicely with white low top sneakers. 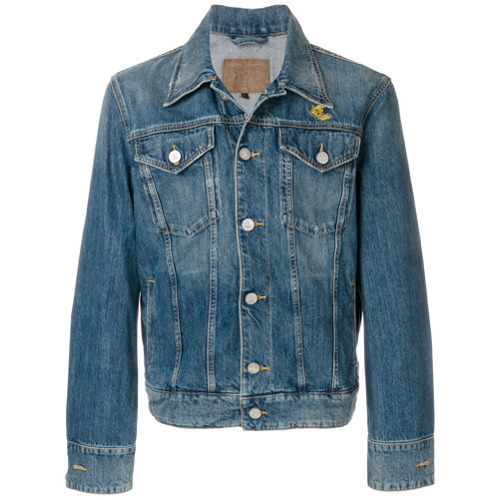 If you're hunting for a casual yet stylish look, rock a Vivienne Westwood Anglomania classic denim jacket with light blue jeans. Both items are totally comfortable and will look great together. Add a sportier twist to your look with white leather athletic shoes. 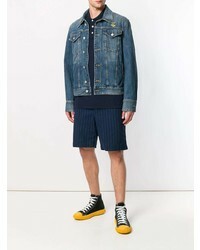 If you're after a casual yet seriously stylish look, dress in a Vivienne Westwood Anglomania classic denim jacket from farfetch.com and black vertical striped chinos. As well as super comfy, these garments look amazing when worn together. 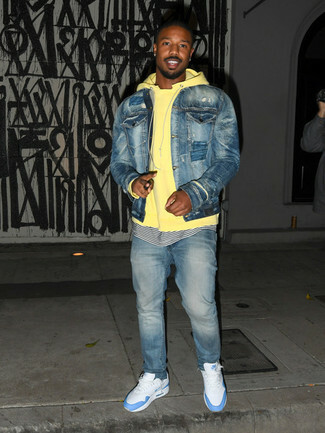 When it comes to footwear, this ensemble is finished off nicely with white leather low top sneakers. As you can see, being a dapper dude doesn't take that much time. 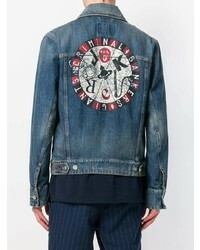 Just marry a Vivienne Westwood Anglomania classic denim jacket from farfetch.com with a beige overcoat and you'll look savvy. 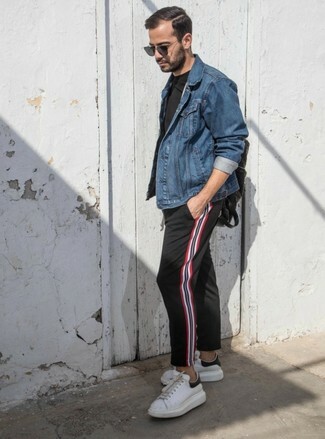 If you're on the hunt for a casual yet on-trend outfit, reach for a blue denim jacket and red and white vertical striped sweatpants. Both pieces are totally comfortable and will look great paired together. Want to go easy on the shoe front? Choose a pair of white leather high top sneakers for the day. 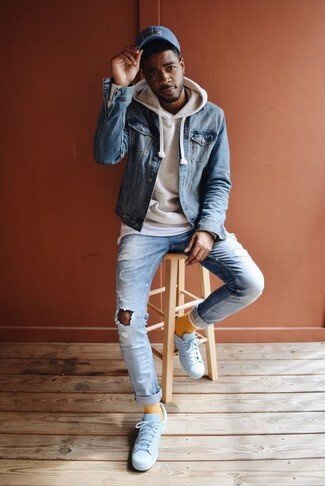 If you're all about relaxed dressing when it comes to your personal style, you'll love this simple pairing of a blue denim jacket and light blue ripped skinny jeans. Turn your sartorial beast mode on and opt for a pair of white leather low top sneakers. 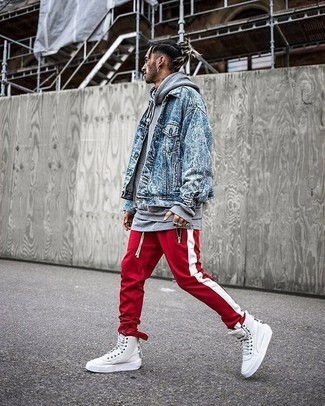 If you prefer comfort dressing when it comes to fashion, you'll love this knockout pairing of a Vivienne Westwood Anglomania classic denim jacket and light blue ripped jeans. 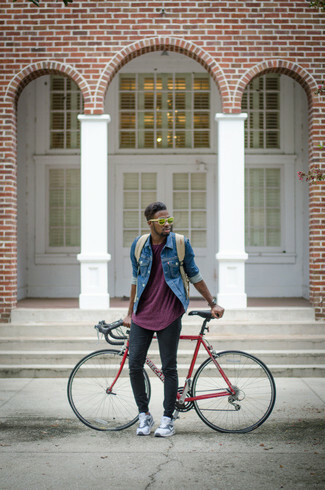 A cool pair of white leather low top sneakers is an easy way to upgrade your outfit.